I got up really close with this one using my Macro lens and extension tubes. These beautiful, gentle little plants are still the scourge of many homeowners who don’t like them on their lawns. I don’t have any on mine, so I wandered over to my neighbors lawn and sprawled myself right there. It is amazing to think that in these tiny, thin little strands their is life intelligence, just waiting to be blown away and then plant itself somewhere to grow. Amazing. That’s true, good spot. Tks for the comments. OOOOOOH, I’m happy to see this one Ken! They’re so delicate up close and yet hearty enough to make a gardener groan. Beautiful image! Thanks Gina. And thanks for the award. I will answer it this week. Thanks for visiting, appreciate it. This is the best view ever! So delicate, colorful, awesome! It was pretty tough taking it. Kept moving in the wind, very low but I enjoyed it. A nice & good macro, Mr Todd. 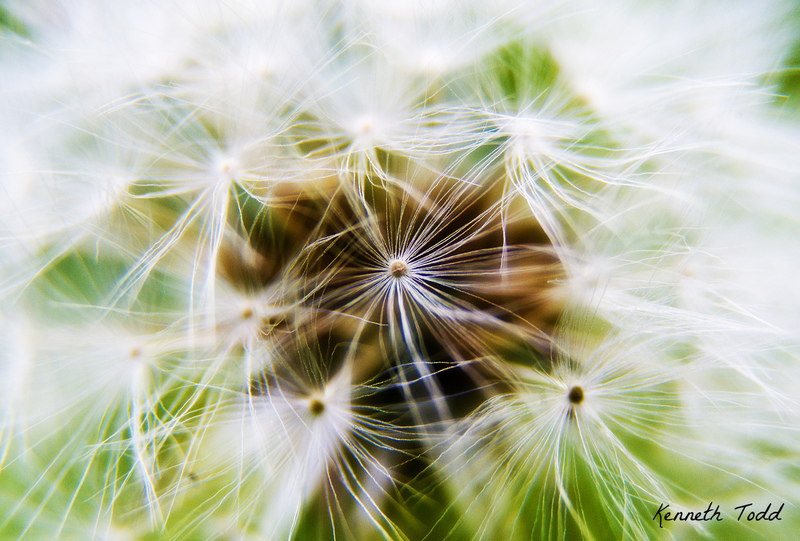 I have always wanted to do a macro shot of dandelion but haven’t had a chance yet. Your’s is picture perfect! Very nice close up shot !